Altough several figures from other wars can be seen, this scene is primarily meant to portray trappers and Woodland Indians from the French and Indian War. Trappers can be used in other American battle scenes such as the American Revolution, War of 1812, Frontier Wars, etc. The Indians are usable in other wars also such as the American Revolution. 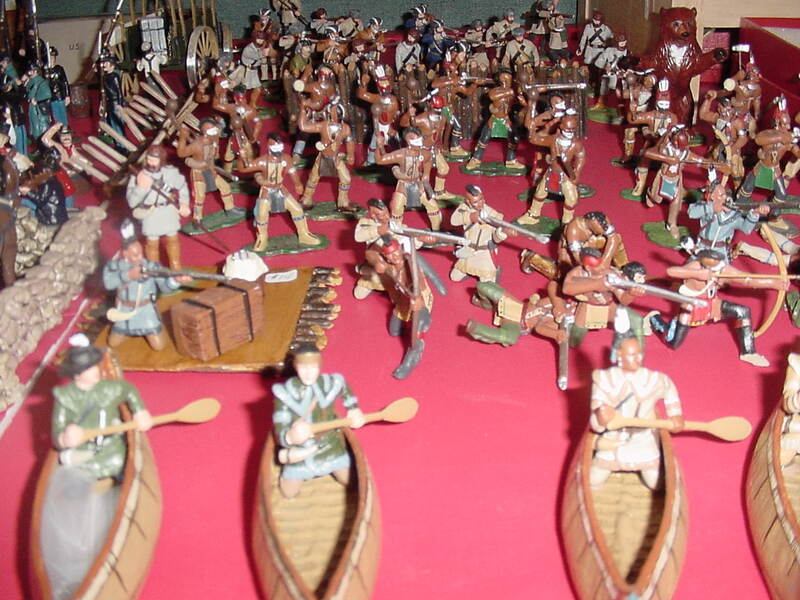 In the foreground are canoes, rafts and a scalping set. A variety of Indian and trapper poses are shown in the rear. Alamo shown at rear as it appeared at the time of the battle (i.e. without bell tower). In the foreground are Mexicans from the Tres Villas Battalian and a Mexican lancer on horseback. Crockett, Bowie and Travis are also available. Americans shown from front to rear are Tennesseans (trappers), Texans and Alabama Red Rovers (massacred at Goliad prior to the Battle of the Alamo). 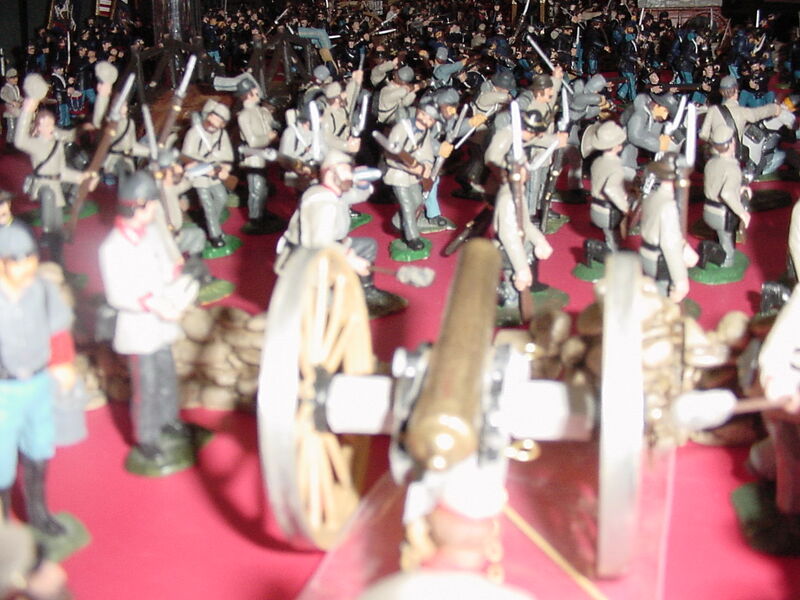 Dozens of infantry, artillery and cavalry poses available for Union & Confederate figures. Six hat styles for Union and eight for Confederate figures expand collector options. Additional hat options for Zouave units. The LeMan's Collection also includes Parrott, Napoleonic and Dahlgren cannons, Coehorn and Dictator mortars and accessories such as walls, gabions, towers and fortifications. Soldier life before and after battles is depicted in the above scene. In the forground are an ambulance, medical wagon, medical staff and a variety of wounded soldiers including an amputee (available with boot). Also shown are modular wall including a swinging gate. The camp scene behind the hospital tent illustrates banjo players, fiddlers, bathers, and loaders. Also shown is a soldier with a chicken behind his back, sentries, Grant, Lee and Jackson. Accessories include wagons, woodpiles, field tent, bottles, barrels, crates, Chevaux de Frise, well, spit, campfires, etc. 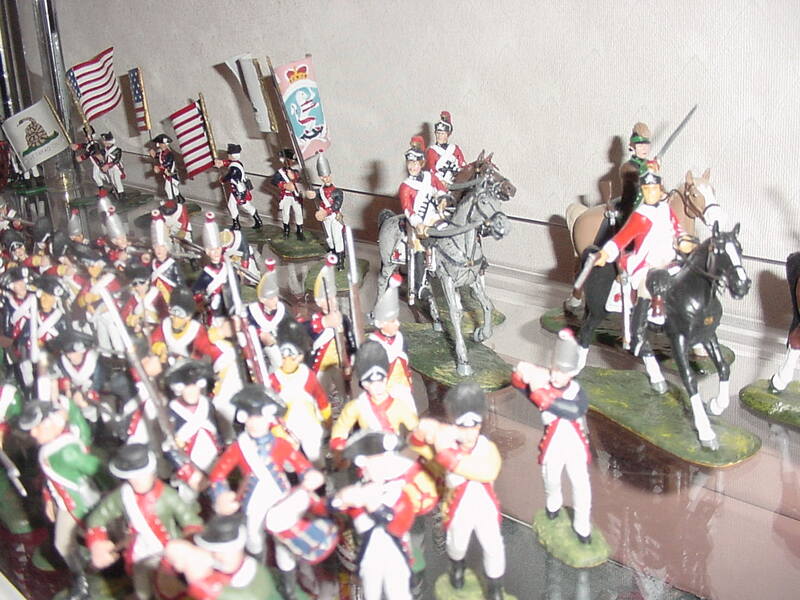 Shown are well known units such as the Continental Army, American Marines, Hessians and the British 38th Regiment of Foot grenadiers. 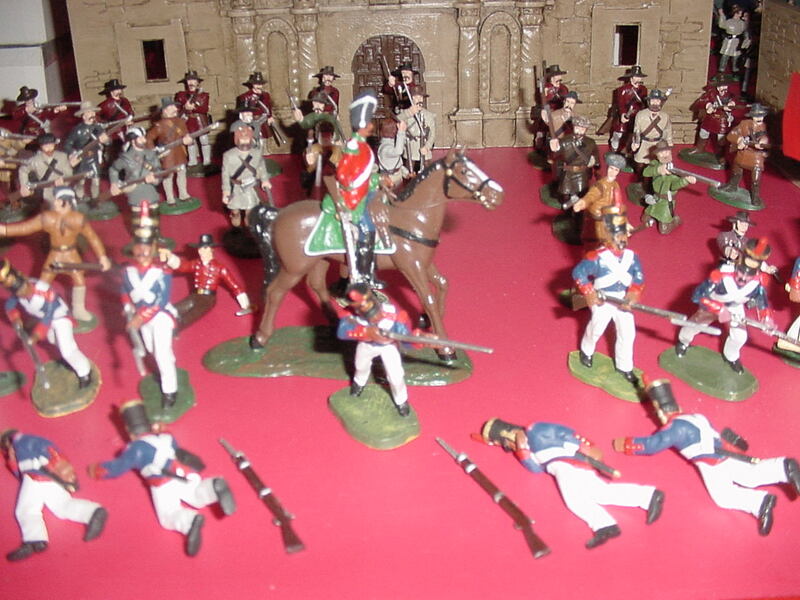 Dragoons represent the British 17th Regiment and "Light Horse Harry Lee's" unit. Additional units such as the British 38th light infantry, British 4th & 5th grenadiers and light infantry, Von Lossberg Hessians, French Soissonais and Luzaun's Legion, Virginia Culpepper Militia, Roger's Rangers, Continental Infantry and Butler's Rangers are also available. 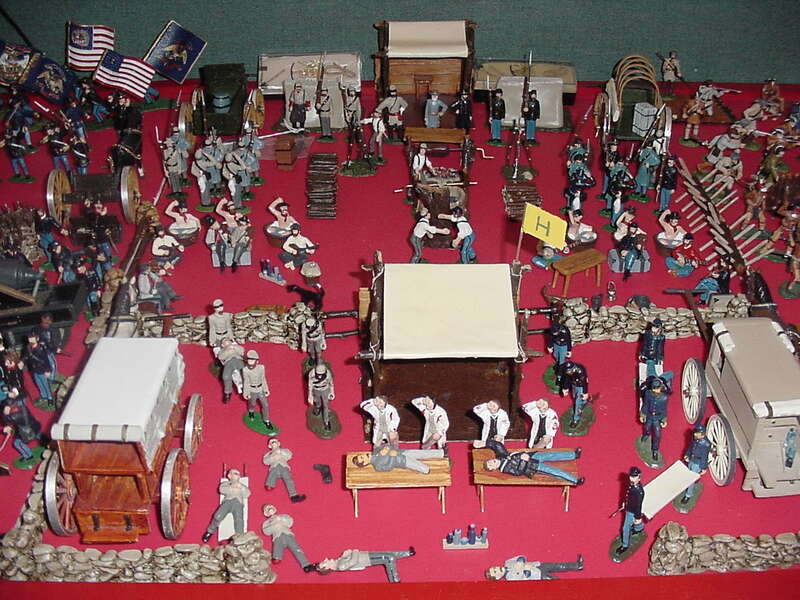 Accessories from the Civil War can be used with American Revolution scenes. 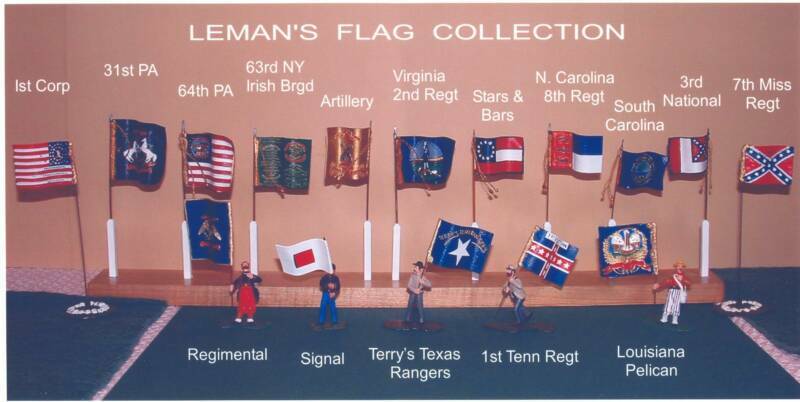 This picture was provided by a collector who was interested in collecting Civil War flags. Many collectors concentrate of other subjects such as artillery, uniforms, etc for various time periods.